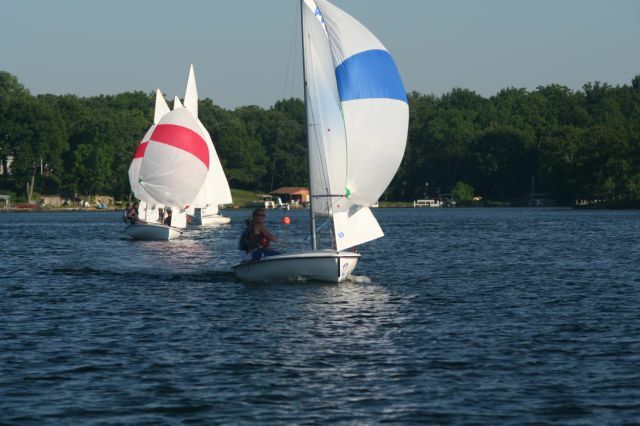 The Lake Beulah Sailing School is a non-profit organization dedicated to sailing education and water safety open to all and affiliated with the Lake Beulah Yacht Club in East Troy, WI. Scroll down to learn more. Join us and learn to sail. The Lake Beulah Sailing School, Inc. (LBSS) is a 501(c)3 not-for-profit organization which has provided sailing education since 1972. Our sailing programs are presented at the Lake Beulah Yacht Club, located at N9220 East Shore Drive in East Troy in southeastern Wisconsin. Programs are designed to provide students with an appreciation of the pleasures of sailing as both a leisure-time and competitive activity; to develop a high degree of competence in the handling and maintenance of equipment; and to teach the importance of sportsmanship, team play, and respect for property. Lessons are offered at various levels from novice to experienced for children and young adults ages 6 to 70. Want to learn to race? Just want to gain confidence on a sailboat? Want to join a group having loads of fun? The Lake Beulah Sailing School is the right place for any or all of those. While the majority of our students are young sailors, we also have an adult course for those looking to learn to sail. Join us! We may be a smaller lake, but our sailing school has been the starting point for many world-class sailors. Former LBSS students have competed in regattas around the world. Two of our ladies (Annie & Stephanie) have even won the prestigious "Rolex Yachtswoman of the Year Award" based on their sailing performances! Read about many of our fabulous alumni sailors here. Click to learn more about Annie. Have you ever taken a leap of faith? Left the safety of shore just for the chance - the hope - that one day you will look back and it will all be worth it? Begin the journey alongside the US Sailing Team Sperry at UNCHARTED WATERS, and watch the odyssey unfold. Click to learn more about Stephanie. Stephanie Roble and Terry Hutchinson were honored at the New York Yacht Club on February 26, 2015 for their outstanding sailing achievements in 2014.